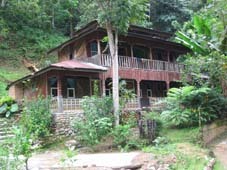 The Garden Inn and Restaurant is located at the top end of Bukit Lawang close to the Jungle Inn and crossing to the Bohorok Orangutan Rehabilitation Centre. Family house with 2 rooms, 2 double beds and 1 single bed 200,000Rp per night. Previously hotels in Bukit Lawang ran on generator power though in Dec 2008 power lines were restored to the top end of Bukit Lawang. I haven't stayed at Garden Inn though have hung out in their restaurant many many times. The guys that run this place are very cool. The food is OK though the service is very good and they have good cold beer. 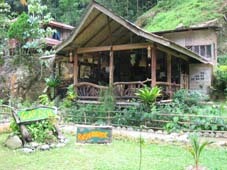 The restaurant is a very nice place to chill out and relax overlooking the jungle. They have a couple of hammocks that you can sit back and relax in. You do not have to stay here to go hang on in their restaurant. Have you stayed at Garden Inn?